It seems that every week there's a new diet fad on the menu. But the age-old practice of cutting out animal products is also back in fashion at a smart villa in Spain. Daisy Finer hunts down her inner vegan… Read the article. 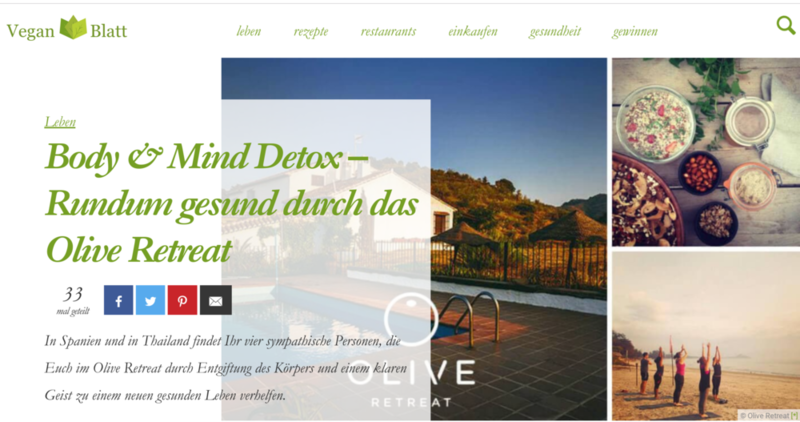 Olive Retreat is perfect for those who want to relax and cleanse gently. The wellbeing retreats help you clear your body and mind with healthy food, gentle exercise, optional classes in wellbeing activities such as healthy cooking or natural facials and plenty of free time to spend as you choose… Read the article. Our first meal on the Saturday evening was all about easing us in gently, and I needn’t have worried: rather than being a juice fast, Olive’s ethos is about allowing your body to detox through healthy, hearty and tasty vegan on wholefoods… Read the article. Nowadays there are any number of spas, bootcamps and retreats to choose from. Even so, it’s all too easy to come back home with none of your problems solved. Fortunately, though, we’ve discovered a retreat that’s a genuinely life-changing experience. Olive Retreat is set in a beautifully converted whitewashed farmhouse near Rhonda, in Andalusia, in southern Spain. With its light and airy guest rooms, 14 acres of gardens and fruit trees – plus the added bonus of spectacular views of the Grazalema National Park – The Olive Retreat is the ideal place to relax and recharge your batteries. The founders, both pictures of glowing good health, are clearly passionate about their philosophy of wellbeing. Their retreats emphasise detoxing, weight loss and wholesome nutrition, with options to study meditation and yogic breathing techniques. The food is entirely vegan, with coffee, alcohol and dairy also strictly off limits. They served up some of the most sensational food we’ve ever tasted, even managing to rustle up a delicious chocolate pudding that doesn’t compromise on healthy eating. Cristina leads classes on nutrition and offers one-to-one sessions for guests to explore their individual issues. Their detox regime may be rigorous, but the days are unstructured, with no pressure and no punishing exercise regimes. Instead you can join in with a poolside yoga session, enjoy a massage or take a stroll in the surrounding countryside. Of course the real test is what happens when you return home. Here too the Olive Retreat shines, because included in the price of retreats is a month of support by phone or email from the resident team. So far we’ve managed not to slip back into bad habits, and there’s no arguing with losing a stone of surplus weight, so it’s a big thumbs-up from Dales Life! IF YOU ARE A WRITER, PHOTOGRAPHER OF MOVIE MAKER - LET US KNOW!